Hiring people who are competent, who get along with others, who treat your customers well, who show a bit of loyalty and hang in there with you—well, you know what this can do for your business. ​I'm Stan Dubin, ​and I've been helping companies hire better staff for the last nine years. After writing 180 articles and delivering 160 podcast shows on hiring, I decided to put my best material into a book. 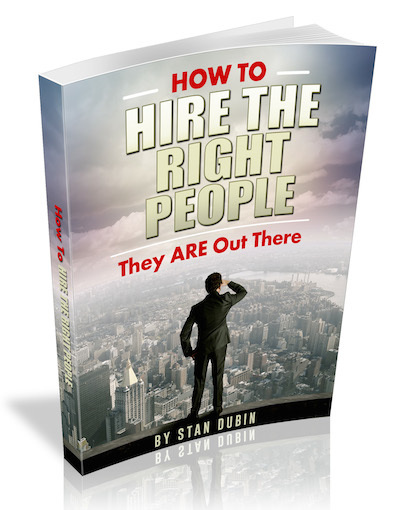 ​It is now published and ready to help you hire the right people. ​How many times have you interviewed someone and a few weeks down the road you discovered this person was NOT the person you interviewed? The book delivers over thirty ways to help you with this. ​How much should you rely on the résumé? ​What if someone you’re interviewing rubs you the wrong way…but you think they’ll do a good job? How important is hiring the right salesperson? Six chapters were written to help you with this vital position. With 65 chapters, you'll learn how to screen out people you do not want and hire the people you do want. Do you have the right person? How To Hire The Right People will help you get it right...one hire after another. Get the book on Kindle, iBooks, Nook and in PDF. All of them are the same price: $9.99. Get your copy now and start hiring the right people!